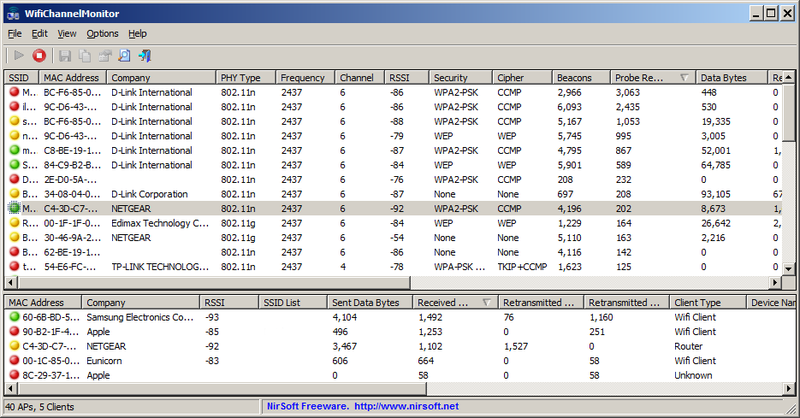 WifiChannelMonitor captures WiFi traffic on the channel you choose using Microsoft Network Monitor capture driver in monitor mode and displays extensive information about access points and the WiFi clients connected to them. The program also allows you to view the information about wireless clients that are not connected to any access points, including the list of SSIDs (network names) that they are trying to connect. For every access point, the following information is displayed: SSID, MAC Address, Device Manufacturer, PHY Type, Channel, RSSI, Security, Beacons Count, Probe Responses Count, Data Bytes, Retransmitted Data Bytes and more. Each client lists MAC Address, Device Manufacturer, SSID list that the client tries to connect, Sent Data Bytes, Received Data Bytes, Probe Requests Count etc. How to extract: Download the ZIP package and extract to a folder of your choice. Launch WifiChannelMonitor.exe. Added 'WiFi Scanning Options' button to the 'Capture Options' window, which opens the 'WiFi Scanning Options' window of Microsoft Network Monitor. Nice program does a lot and easy to use, thank you developer for your hard work.Lets me see everything and anything way thorough software. 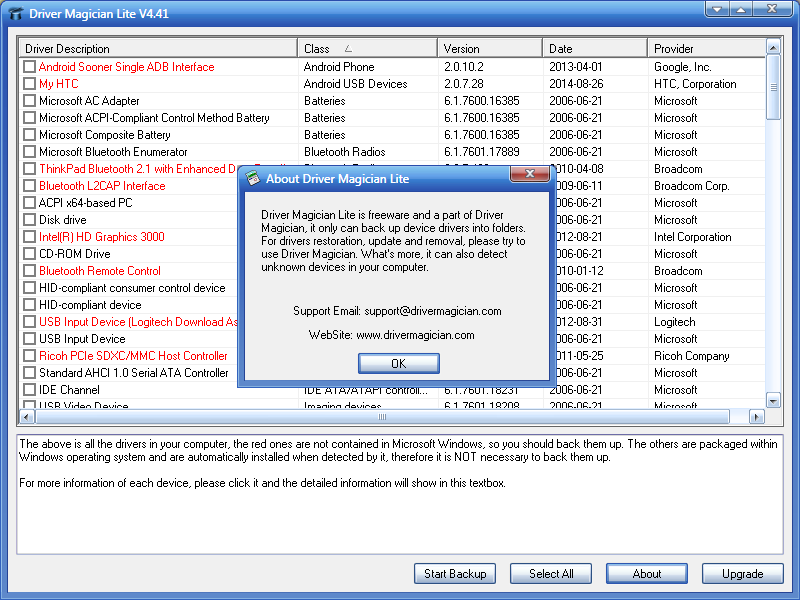 Driver Magician Lite identifies all the hardware in your system, extracts the associated drivers and backs them up to a location of your choice. Later, when you need to reinstall/upgrade Windows, you can restore all the saved drivers just as if you had the original driver diskettes in your hands. This is especially useful if you inherited an old machine or bought a white box system and did not receive all the original driver discs. Writes settings to: Windows registry. It remembers the folder that you last select to write the backup files to, which does not affect portability. How to extract: Download the portable ZIP package and extract to a folder of your choice. Launch Driver Magician Lite.exe. With 4.76, I did not find any entries in the registry. Nor did it remember the last backup folder. MiTeC EXE Explorer reads and displays executable file properties and structure. It is compatible with PE32 (Portable Executable), PE32+ (64bit), NE (Windows 3.x New Executable) and VxD (Windows 9x Virtual Device Driver) file types, as well as .NET executables. The program enumerates introduced classes, used units and forms for files compiled by Borland compilers. It contains powerfull Resource Viewer that is able to abalyze and display all basic resouce types and some extra ones as JPEG, PNG, GIF, AVI, REGISTRY and Type Library viewer that enumerates all objects and creates import interface unit in Object Pascal language. Every type of resource can be saved to file. Program data can be output to a text report. How to extract: Download the ZIP package and extract to a folder of your choice. Launch EXE.exe. All MiTeC software that I use, writes to registry. Therefore Ive used JauntePE060Nightly to make it true stealth. WhoIsConnectedSniffer is a network discovery tool that listens to network packets on your network adapter using a capture driver (WinpCap or MS network monitor) and accumulates a list of computer and devices currently connected to your network. WhoIsConnectedSniffer uses various protocols to detect the computers connected to your network, including ARP, UDP, DHCP, mDNS and BROWSER. For every detected computer or device, the following information is displayed: (Some of the fields might be empty if the information cannot be found inside the packets) IP Address, MAC Address, name of the device/computer, description, Operating System, Network Adapter Company, IPv6 Address. After collecting the connected computers/devices information, you can easily export the list to tab-delimited/comma-delimited/xml/html file. How to extract: Download the ZIP package and extract to a folder of your choice. Launch WhoIsConnectedSniffer.exe. The information of the selected network adapter is now displayed in the window title. Can't get past the 'Capture Options' screen . ie. No Go . SmartSniff is a network analysis/diagnostic tool that allows you to capture TCP/IP packets that pass through your network adapter. You can view the captured data as sequence of conversations between clients and servers in ASCII mode (for text-based protocols, like HTTP, SMTP, POP3 and FTP) or as hex dump (for non text-based protocols, like DNS). 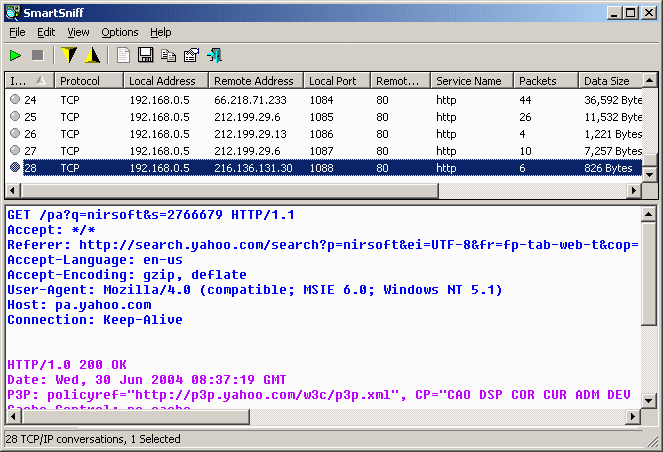 On Win2K or above, SmartSniff is able to capture TCP/IP packets using raw sockets. This method has some limitations and problems, but it does not require any additional installation. A better way to capture TCP/IP packets is to install the open-source WinPcap capture driver, functional on Windows 98 and later. How to extract: Download the ZIP package and extract to a folder of your choice. Launch smsniff.exe. Optionally, add IPToCountry.csv or GeoLiteCity.dat in the same directory as SmartSniff to show the Country of origin for each IP address. Fixed bug from version 2.28: SmartSniff crashed when selecting loopback interface or other network interfaces without connection information. No I'm not - a portable program is one that doesn't install files. @kermode - it works on raw sockets in winXP SP3, so it is portable for some users at least.